Gallipolis City Commissioners discuss business Tuesday evening. From left to right sit Mike Fulks, Stephen Wallis, Tony Gallagher, Cody Caldwell and Beau Sang. 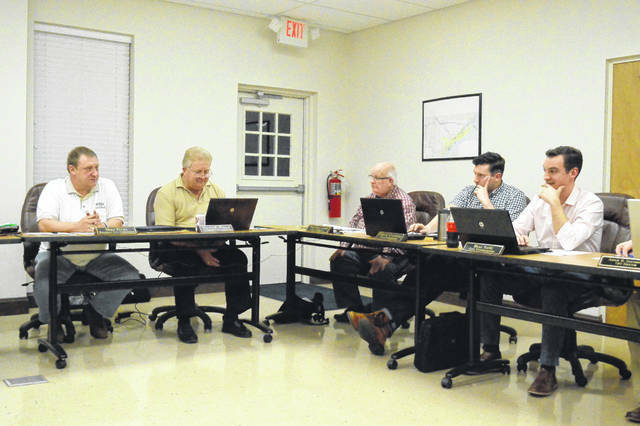 GALLIPOLIS — City Commissioners passed the first reading of the city’s 2018 budget Tuesday during a special meeting in the Gallipolis Municipal Building. According to budget information pulled from the meeting, in 2013 the city had pulled in $3,557,074.84 in revenue or the general fund, $3,477,758.68 in 2014, $3,285,921.04 in 2015, $3,139289.24 in 2016, $3,097,447.96, and $3,169,352.70 for 2018 estimates. According to City Clerk and Auditor Annette Landers in a previous meeting, at the beginning of 2017, the city’s general fund had a estimated carryover budget from the previous year of $233,595.10. From 2017 into 2018, it has a carryover estimate of $385,542.68. Landers said during the previous year’s figure estimates, the city had not expected it would see a growth in money saved. Typically, the carryover has been gradually shrinking over the last several years as city officials voiced concern over growing financial concerns. Greene was not at this week’s meeting due to personal reasons with City Manager Interim Ronnie Lynch filling his seat. In further news, commissioners voted four to one to re-appoint Adam Salisbury as the city solicitor for another four years in a first reading. Commissioner Tony Gallagher voiced opposition with his vote in that he felt the public had not been notified of city jobs as they became available in the past and that positions with the city had not been advertised. He said he knew individuals that may be interested in the solicitor position and he had a problem with the motion. He said he was “not against Adam” but could not vote for something he felt had not been advertised. Commissioner Stephen Wallis said with the re-appointment of an individual he did not know “that was necessary” as it was with a position they were trying to replace with a new employee. https://www.mydailytribune.com/wp-content/uploads/sites/42/2018/02/web1_DSC_0756.jpgGallipolis City Commissioners discuss business Tuesday evening. From left to right sit Mike Fulks, Stephen Wallis, Tony Gallagher, Cody Caldwell and Beau Sang.